The port of Vanino on the east coast of Russia installed a ship to train transfer system for alumina back in 1994 which included 4 Flow Force Technologies impact weighers. The weighers controlled the train wagon loading to a pre-specified batch weight at flow rates up to 500 t/hr each. So with 4 weighers feeding in parallel together a loading rate of up to 2000 t/hr was achievable. Commissioning of the impact weighers was carried out under the supervision of Flow Force MD Brian Lewis who also provided training on the weighing equipment to the Russian engineers via an interpreter. Instruction manuals were provided in Russian and English. After successfully commissioning the weighers in 1994 and with some interesting experiences to remember about life and travel in Eastern Russia the people at Flow Force heard nothing more until early this year. It seems that an accident had occurred and 2 of the Weigher Controllers had incurred severe damage and needed to be replaced with new units. However the new units needed to be plug compatible and operator compatible with the original units. Flow Force responded to an enquiry from the Russian owner with great interest. As is often the case with electronic equipment the original Controllers had been superseded some years earlier; although the weighers themselves have not substantially changed in that time and were still operating satisfactorily anyway. Fortunately through good management of project documentation Flow Force was able to retrieve all the original design information so that a new but compatible design could be formulated. The new Controllers have been delivered to Vanino within the deadline set by the customer. 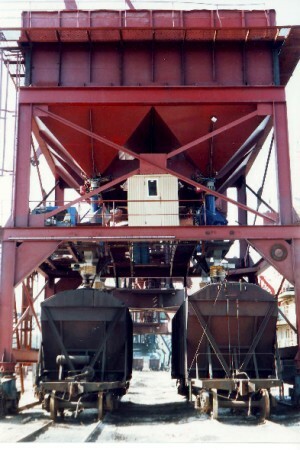 The photograph shows the train loading facility with two of the impact weighers just visible at the operating level above the telescopic chutes feeding the wagons.